Home>Blog>Water Care Tips>Leaving On a Winter Vacation? We highly recommend putting a holiday tender or floating dispenser in the water with chlorine or bromine discs to ensure your hot tub is clean, not green, when you get home. Use some granular chlorine or bromine to spike the levels before you leave. Better to have it a little high than too low. Check your pH and alkalinity levels and ensure they are in the correct range. Ensure your water level is topped up so that the pumps won’t develop an air leak or run dry. Check to make sure your cover is seated properly and latched. Check for ice on the top edge of the tub that could leave a space for heat to escape. Shortly after you arrive home, open the lid to let it breathe, check your levels and adjust accordingly. If you choose to shut down your tub for an extended period of time over the winter, ensure that you follow the proper procedure for draining such as blowing out the lines. 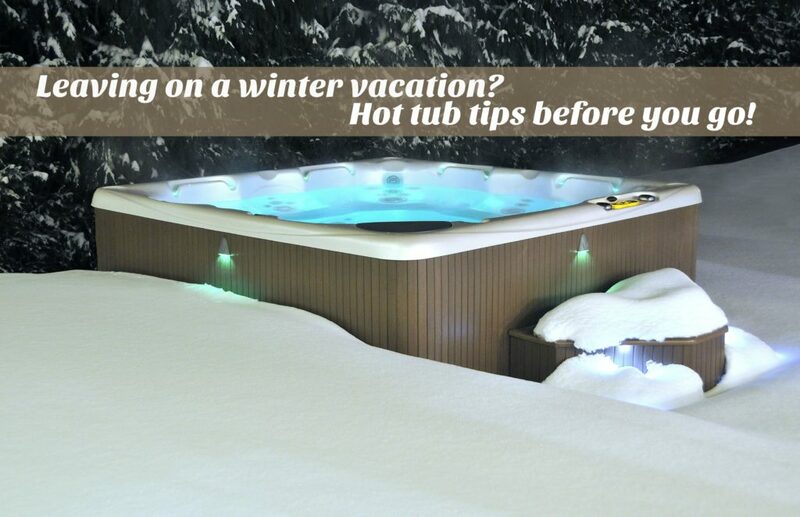 Improper winterizing can cause issues in your hot tub plumbing! Avoid costly mistakes and talk to the experts at Beachcomber Hot Tubs, Pool & Patio. Fill out our online Service Request form or call Richard in our service department (403-327-7665) today to discuss proper winterizing techniques or to book your Hot Tub winterizing by our trained staff. If you have questions about what to do with your tub in the summer when it’s super hot outside, check out the tips in this article, Thinking About Draining Your Hot Tub For the Summer. Have other questions related to maintaining the water in your tub? Check out our great Water Care FAQ page here.